Photo by rawritzrichii, not to be reposted elsewhere without the original photographer's express permission. VGE-BT03: Demonic Lord Invasion introduces a new play style for OraThin. Essentially an extension of their divination strategy, this build is characterized by making use of a high amount of soul and the Godhawk-Tsukuyomi line to enhance its ability to predict the future. Ichibyoshi, seemingly an analogue for the mythic Yatagarasu bird that embodied the will of heaven, is Tsukuyomi's herald; accordingly, his one and only skill is to look at anywhere from 0 to 5 cards from the top of the deck to bring her Crescent Moon form into the field through a superior ride. During the initial release of set 3 this was considered the skill's only utility, but Misaki has taught us better since then. The skill also requires any other cards examined in this way to be sent to the bottom of the deck, in whatever order his cardfighter desires. So if the skill succeeds, then that gives an immediate one-card advantage, while even if it fails it can be combined with subsequent entries in the moon goddess line to stack the deck through careful trigger placement. Crescent and Half Moon Tsukuyomi each search five cards in an identical fashion. Because all forms of Tsukuyomi are ridden from the deck, this protects the player from having to pay the cost of riding, giving a total three card advantage at its maximum potential. While this doesn't directly add any cards to the hand, preserving it gives the same general effect as that's three cards more to guard with, or three more calls that aren't straining your advantage. Even if none of the superior rides are successful, so long as you normal ride each entry in the series, then on the turn that you reach grade 3 you have a staggering 15 card stack on the bottom of your (usually) 34-35 card deck instead of 12/31 or 12/32. So when the rides are unsuccessful, you still have the same general number of cards to dig through to reach your stack as you would with successful rides. This method of riding does come with drawbacks. Each form of Tsukuyomi is weaker than standard units of similar grade, and her final form is overall weakened if any of the other Tsukuyomi cards are missing from the soul. And while Amaterasu could consistently reach 20000 power with Milk even if she had just two cards in hand before her drive check, and get as high as 24000 with four in hand, Tsukuyomi with even one piece missing from her soul maxes out at 19000. It's not a primary concern for the English scene at the moment, but Amaterasu's 24000 is also a more serious threat to crossride units, while Tsukuyomi's 21000 is the same as Amaterasu with only two cards. So just as Tsukuyomi-no-Mikoto in myth shared his place in the heavens with Amaterasu, our Tsukuyomi can be complemented well by including Amaterasu in the deck. In addition to her inherent divination skill allowing the stack to be further built up when ridden as an alternative to Tsuku, by making her the only other grade 3 in the deck, that ensures that so long as Milk is in the back line, you will almost always have a 21000+ power vanguard. And if ridden correctly from Godhawk up to Goddess of the Half Moon, Half Moon's soulcharge 2 will ensure that riding Amaterasu as your grade 3 will leave you with a soul of six once the main phase has passed, just two cards away from being able to threaten with a megablast. For additional soul support, Oracle Guardian Red-Eye can soulcharge 1 when his attack hits, simultaneously building up for either a megablast or Tsukuyomi's draw skill while also removing another card from the top of the deck to reach your stack. Blue-Eye is less recommendable due to having only 5000 power, which limits his boost to 11000-power Tsukuyomi units, and his skill is only active when you already have six soul, allowing you to send a card to the bottom of your stack while drawing from the deck. This is a great maneuver, as it simultaneously shaves off another card while building those on the stack, effectively letting you get 2 cards closer to your stack instead of just 1, but the price is a 5000 power unit that simply can't form a 16000-power line with anything but the Goddess of the Full Moon. Twin Swords Awakening introduces a trio of new cards to support six-soul OraThin. Hare of Inaba soulcharges from the hand when called, which puts you at a disadvantage, but the ability to choose which card to soulcharge means that you can add in missing pieces of Tsukuyomi while also adding a sixth card in the event that Red-Eye is being guarded or Amaterasu isn't available. Evil-eye Princess, Euryale is the first card to utilize the bind mechanic, binding a card from the opponent's hand when she's ridden or called and you have six or more soul. While that card returns to the opponent's hand in the end phase, it temporarily puts them at a one card disadvantage in a deck where you most likely already have at least a two card lead. Euryale naturally forms a complementary formation with a Tsukuyomi vanguard and Silent Tom in the opposite column, removing one card from the opponent's hand while demanding seven cards with at least a 6000-power booster behind Euryale, and a Tsukuyomi-Milk and Silent Tom-Gemini lineup. Battle Maiden, Tagitsuhime meanwhile is a 9000-power grade 2 that gains +3000 power while attacking. Like Euryale, this skill is restricted by six soul rules, and like similar grade 2s for RoyPala, ShadowPala and Kagerou, Tagitsuhime maxes out at 20000 power. Whether she's worth the investment over or in concert with Wiseman and Tom is an issue of personal experience, as that 20000 power is useful against top decks like Gold Paladin, but in the face of 11000 and higher units like those found in Nova Grappler and Dimension Police, Tom becomes more effective on the principle that he demands multiple cards to form a 10000-power shield instead of a single trigger unit to defend with. In crossride formats Tagitsuhime does have an important place for forming easy 18000-power lines, so she is a card that gets better with age. 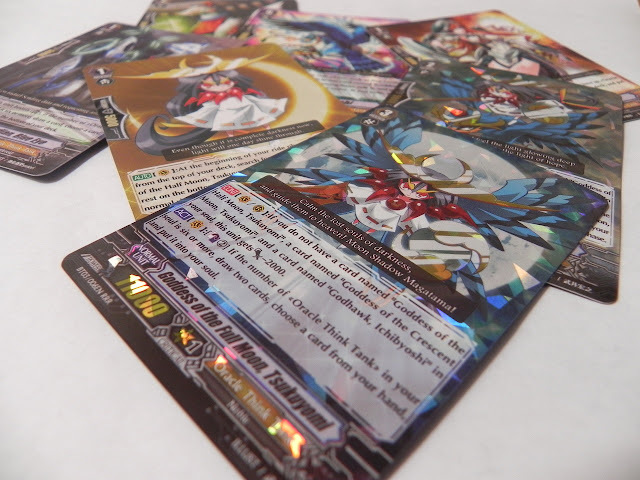 Since the Tsukuyomi play style is naturally supported by existing divination cards like Cocoa, it's a very organic evolution for any OraThin cardfighter, and is used by a number of professionals in Japan's team tournaments. As some closing notes, these are the general probabilities for a successful superior ride each turn, taking into account how many cards have been removed from the deck through drive and damage checks (supposing 2 damage checks per turn up until G3), draws, Godhawk-Tsuku stacking skills and Tsukuyomi's grade 2 soulcharge. These numbers assume that each superior ride is successful, that the Tsukuyomi cardfighter takes the first turn, and that four of the next card in the line remains in the deck after each ride. Next time I come back to Oracle Think Tank, it will be to discuss their coming empty soul play style from set 7, "Rampage of the Beast King." Alfred's Place vs Crossride: The "Fifth Marron"